Prince Charles is a bright representative of the modern generation of British monarchs. Prince of Wales is an example of a true aristocrat. He grew up in the family of Queen Elizabeth II and her husband, Philip. Charles was brought up in the traditions of the Windsor dynasty. He is a potential heir to the British throne and can become an important figure in the British Commonwealth of Nations. Prince Charles is the first child in the family. He was born at Buckingham Palace a year after the marriage of Princess Elizabeth and Philip, Duke of Edinburgh. 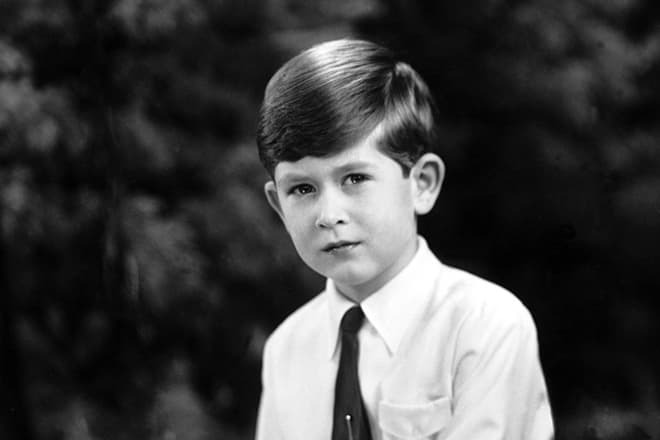 The grandson of King George VI at the age of three, after the death of his crowned grandfather and the accession of Elizabeth II, became the first claimant to the throne. Two years later his sister Anne was born. Ten years later - in 1960 -his brother Andrew was born. In 1964, the Queen gave birth to the youngest son Edward. Prince Charles, as the heir to the British crown, studied at the elite school in London. 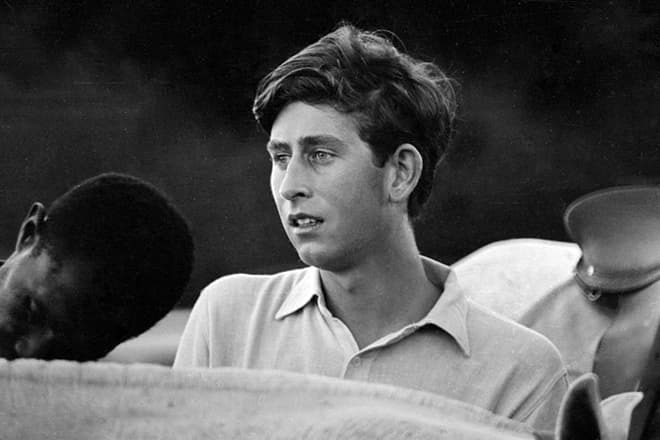 Prince of Wales entered Cambridge University and studied history until 1970. Five years later, according to the tradition of the oldest (after the Oxford) university, the prince was awarded a Master of Arts degree from Cambridge. In 1952, after the coronation of Elizabeth, Prince Charles became Duke of Cornwall. It is a British title, which automatically passes to the eldest son of the monarch. The official name of Charles is "His Royal Highness the Duke of Cornwall." In 1958, the title "Prince of Wales" and "Earl of Chester" were added to the official name of Charles. If the eldest son of the Queen ascends to the throne, he will become King Charles III. There are rumors that Prince Charles prefers to become George VII - this is his fourth name. But the royal court and his speechwriters officially denied this information, pointing out the prematurity of the discussion. 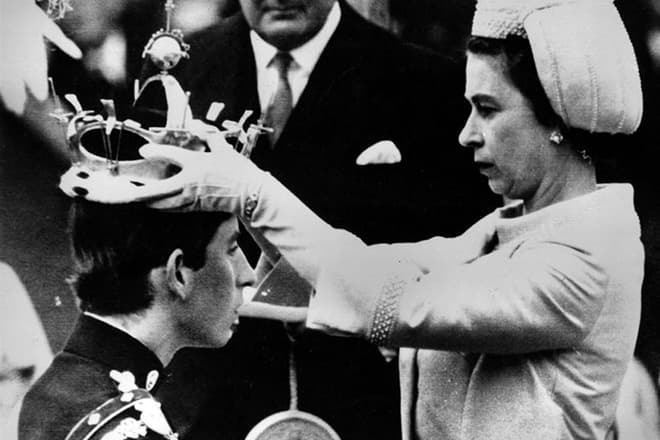 In the summer of 1969, in the Welsh castle of Caernarfon, at the investiture ceremony, the Queen Mother put the Crown of the heir to the throne of the crown on Prince Charles's head (also known as the crown of the Prince of Wales). After the coronation, the prince became an active participant in the social life of England. The following year he attended a meeting of The Cabinet of the United Kingdom. In the 1970s, the Prince of Wales participated in several meetings of the House of Lords. For the first time in the 300-year history of the monarchy, the heir was allowed to participate in the work of ministers. Charles was introduced to the list of candidates for the post of Australian governor-general, but because of the constitutional crisis that erupted in Australia, the prince refused that post. 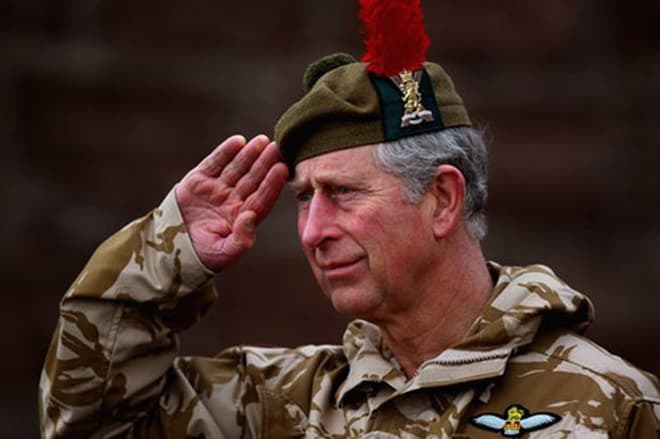 In the early 1970s, Prince Charles joined the military service. After the training course, he was enrolled in the air force: Charles is pilot of a helicopter and fighter. A few years later he joined the fleet of Britain, where he served for two years. After returning from service, Prince Charles devotes time to charity. 350 structures were under his patronage. He founded the Prince's Trust as well as 15 organizations working in the field of the nature protection and urban environment. The heir is interested in alternative medicine, supports projects that lobby the rights of small peoples and sexual minorities. Prince Charles is a parishioner of the Anglican Church, but he is interested in Orthodoxy and has visited Mount Athos many times. The Prince of England came to Russia in the mid-1990s and 2003. 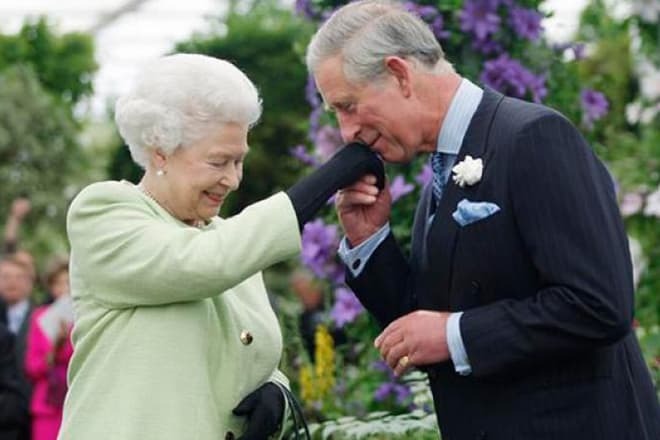 Because of the elderly parents, Charles took on more responsibilities of the royal family. Charles is fond of polo. He likes fishing and gardening. Charles spends his free time drawing and writing scripts for documentary films. He is the author of books on painting and architecture. In the summer of 2013, he visited the film studio, where his favorite TV series "Doctor Who" is filmed. Prince Charles is a bright personality. Filmmakers repeatedly used his biography. In 2006, the historical and biographical drama by Stephen Frears "The Queen" was released, describing the first days of the royal family after the death of Princess Diana. Helen Mirren played Elizabeth II, and the British actor Alex Jennings played the role of Prince Charles. In 2011, the movie "William and Kate" was released, where Ben Cross played the heir. In his youth, the eldest son of the royal family was known as Lovelace. In the late 1970s, he proposed to Amanda Knatchbull, who was related to the British monarchs (Charles's second cousin), but Amanda refused the heir. In 1980, Prince Charles was dating Sarah Spencer - a girl from an aristocratic family, the daughter of the viscount. But Sarah's younger sister Lady Diana became the prince's wife. A beautiful wedding took place in the summer of 1981. It is noteworthy that the newlyweds were of the same height: Charles and Diana are 1.78 meters. The young couple seemed to be a happy family, but relatives and close friends of the couple knew about scandals. 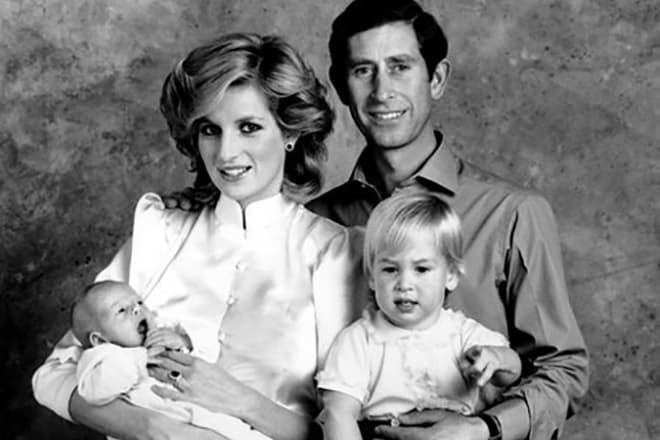 A year after the wedding, Prince William was born, and two years later (in 1984), Diana gave birth to their second son, Prince Harry. The British loved Diana, and when the rumors of the adultery of Prince Charles with Camilla Parker-Bowles appeared, the reputation of Charles suffered. The English took the side of Diana, the "people's princess." Diana's death in Paris in 1997 caused a substantial outpouring of worldwide grief. And Prince Charles, who divorced his wife a year before her death, was criticized. The love story of Prince Charles and Camilla Rosemary Shand began in the 1970s before his marriage to Diana. According to the rumors, the Queen Mother considered the untitled noblewoman (gentry) wasn’t a good match for her son. Camilla married the officer Andrew Parker-Bowles. But in the 1980s, Charles and Mrs. Parker-Bowles began secret relations, which was the reason for the divorce of the Prince and Diana in 1996. Camilla left her husband even earlier - in 1995. After the divorce with Lady Diana, Prince Charles planned to marry Camilla, but the death of his ex-wife and a wave of outrage forced the royal family to postpone their wedding. The couple married in the spring of 2005. For the first time in the history of the British crown, the union was not consecrated by the church. 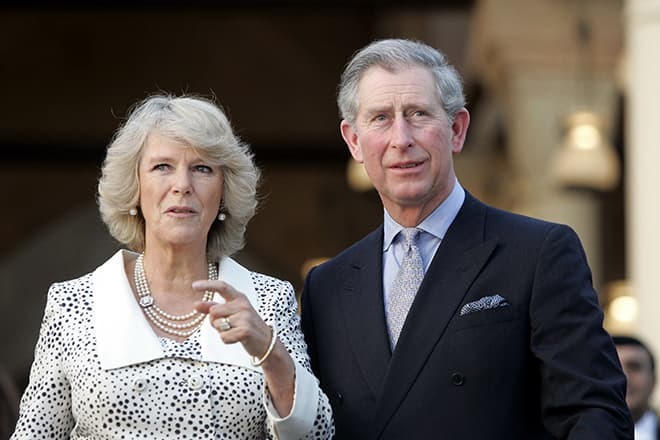 The 35-year-old relationship between Charles and Camilla finally obtained legal status. Camilla received the titles of her husband but preferred to refuse the title of Princess of Wales, using the other - the Duchess of Cornwall. Today, a wave of negativity around the name of the second wife of Prince Charles has settled down. The British noticed how happy the heir was next to this woman. Maybe Camilla is not so beautiful as Diana was but she is a virtuous woman. The Queen Mother and his sons accepted the choice of Prince Charles. In August 2017, German media reported that the sons of Prince Charles have a sister, Sarah. The yellow tabloid "Globe" wrote about the secret order of the Queen Mother in the early 1980s to fertilize the egg of Diana with the Charles seed, so Elizabeth wanted to make sure that the daughter-in-law is capable of giving birth to a child. When the queen was convinced of the Diana’s fertility, she ordered to destroy the egg. But the doctor allegedly disobeyed and gave it to a woman who could not conceive. Because of the threats, the woman who gave birth to the "princess" moved to America. The British didn’t believe this information, which was published on the 20th anniversary of the death of the "people's princess." There are rumors that the British Queen intends to pass the throne to her eldest grandson - Prince William, who has a strong family and already had a third child. In this case, Prince Charles will remain without a throne.